Lobstah, I was also afraid that without a specific pattern I will ruin the overall picture with senseless stitches here and there but to my surprise, when I sit at the table and look at my panels I somehow know what to do next, what stitches to use, what colours, and it all composes a fairly consistent picture (at least I think so! *^v^*). Kendra, it's not that complicated as it sounds, I hope next time warping and weaving will be easier, maybe I just went straight into the deep water with the linnen warp, I should have started with wool instead. But I'm not discouraged at all and next weaving session is coming (I hurt my finger and could try again on Monday morning). On Monday evening we went to watch a special movie - the document presenting old Ukrainian customs connected with several holidays: laments over the grave and feasting with the dead, Kust - the festival of Life, the holy tree, Rusalki - the festival of the dead wandering spirits, and in all of these customs the main part played beautiful songs, with traditional lyrics and melodies, sung a capella by the old women. Sad thing is that the only ones interested in preserving those customs are old women, because all the young ones leave their villages as quickly as possible and move to towns, so they change their lives completely and forget about their traditions. 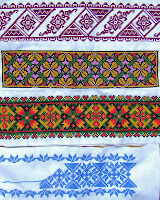 But this movie was also great because I could see the traditional Ukrainian embroidered outfits - blouses, skirts and aprons, snowwhite with colourful flowers, all cross-stitched. I've been having a love affair with this stitch for a long time now and I've done many projects in this technique, like pictures (my favourite is the Four Seasons cycle) or cushion covers with flowers on them. I also tried the traditional Ukrainian motives, like these bands on the photo, I haven't decided what to do with them yet. 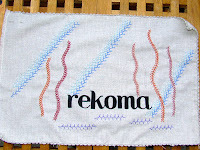 I thought this stitch had no secrets for me, but I've never tried it in any free-hand embroidery, and when I looked up cross stitch family in Susan's stitch dictionary I found something interesting: namely the Rice stitch. I've achieved the similar result with Feather stitch or Cretan stitch, but it also looks interesting in this stitch and I'll give it a go soon. My three panels are getting very crowded with motives and stitches, but I feel that this should be the case. I believe I need another week or so to finish them, and then I'll proceed to the next embroidery project (I have two in mind already, but I really want to make them one by one! ^^) . (More photos on my Flickr). 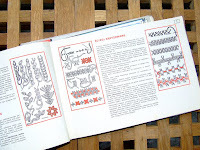 And here are two books that I've been given be my Grandmother, showing everything she knew about embroidery (just look at them, they were used millions of times and the first one is in pieces, although not a single page is missing! 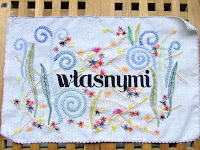 ^^): the first one is about many types of embroidery, with individual stitches and some small patterns; the second one teaches a beautiful type of embroidery from the region of Poland called Kaszuby (close to the Baltic sea) - characteristics are: it's done on the grey linnen with only a few colours - black, two shades of red, blue, green and yellow, and white, and the motives are the flowers. My comment has no relevance to the entry. I just wanted to say Hi. 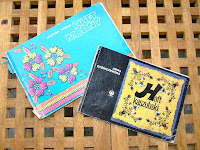 I have been reading your blog for about a month now. I really enjoy seeing your projects and your crazy outfits. I wear wacky clothes myself, much to my friends chagrin. They are embarassed sometimes to be seen with me. LOL! Ok, just wanted to say Hi and make myself known. Take care and I will visit again soon.